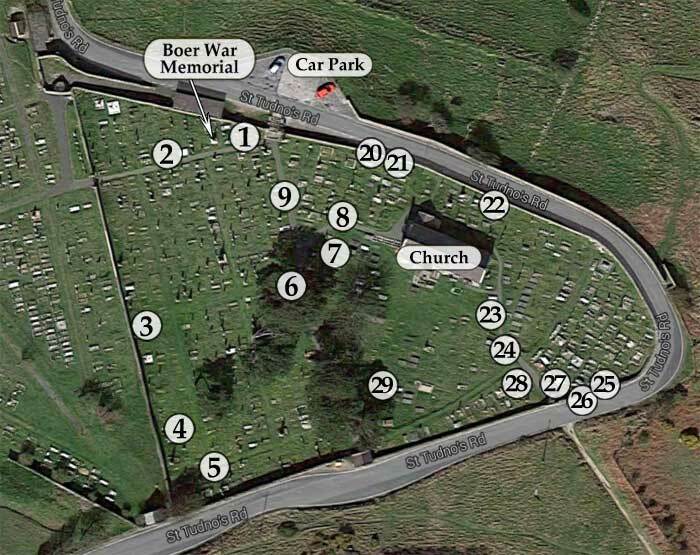 Use the map, at the bottom of the page, to find the interesting graves we’ve selected outside St Tudno’s Church. Click the person’s name below for details about them. The Parish of Llandudno requests that for their own safety, all visitors should keep to the paths, as the ground in the churchyard is very uneven. St Tudno’s churchyard adjoins the Great Orme municipal cemetery. Click here to discover interesting graves there. Near the northern entrance to the churchyard stands Llandudno’s memorial to the four local men who died in the Boer War. They and others who served are also commemorated on a plaque in the Town Hall – click here for more information about them. St Tudno's Church has produced its own guides to the churchyard, which you can download as pdf files here. They contain more information about the history, natural history and management of the churchyard.